Toyohara Kunichika (1835-1900) Thirty-Six Modern Restaurants and Views of Civilisation: Yojuro Restaurant at Shintomicho, 1878. Oban. The print is redolent also of scenes by the new European realists in Paris at roughly the same time. Degas and Manet, for instance, experimented with these close cropped compositions; a seemingly artless slice of life, a busy street, an open door, evening revellers taking in a show or a stroll or entering a restaurant. 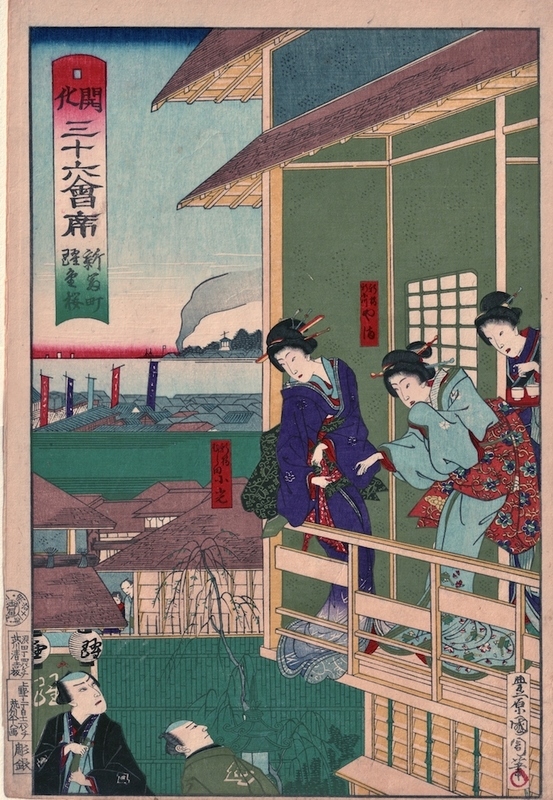 The raised viewpoint allows a vista over the rooftops of the rapidly growing city, with the evidence of industry across the bay; while in the foreground the traditionally dressed geisha on the balcony are exchanging pleasantries with the men down on the ground; which of these Kunichika intended as a 'view of civilisation' is not entirely clear! The architecture and drawing are immaculate and the scene of ‘floating-world’ pleasure is beautifully realised. A very nice print with fine colour and impression and in fine condition.